The Dow broke records in Dec and Jan – also in Feb? January was a record-breaking month for shares (but not all) – just as was December, but in the opposite direction, of course. If you had taken a vacation in the winter sun in those two months you would have asked what all the fuss was about – the Dow was pretty much unchanged! That was despite the mammoth 2,500 point ‘V’ formation. For those of us watching every day, it was certainly full of excitement. At the beginning of December, I positioned VIP Traders Club members short and at Christmas time, I noted the plunge appeared overdone and advised members take some great profits off the table right near the lows. OK, I confess I mis-judged the extent of the January rally. I did not believe it could carry quite so far. My original upper target was the Fibonacci 62% retrace at 24,900 but it surged one more time last week to a high at 25,440, or 540 pips above my target (2.2%). That was a big miss. 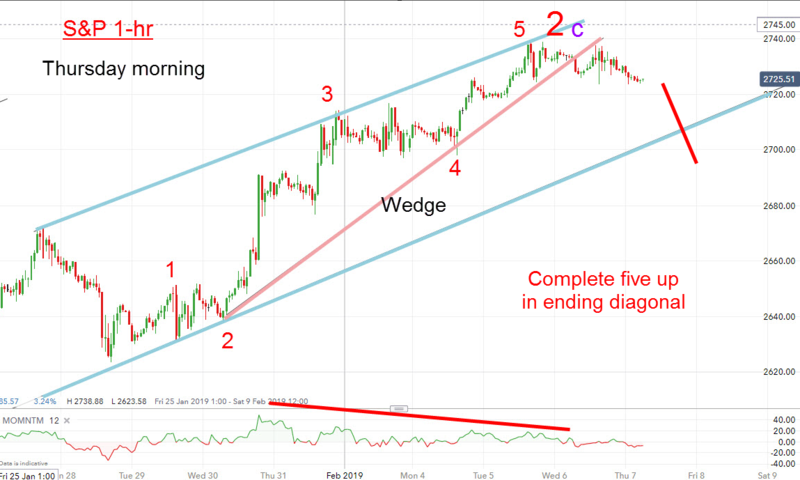 I had a lovely five wave pattern in my wedge (or ending diagonal) on a strong momentum divergence. Remember, when you see a momentum divergence at the end of a trend, it indicates the waning power of the bulls and eventually the bears take over. 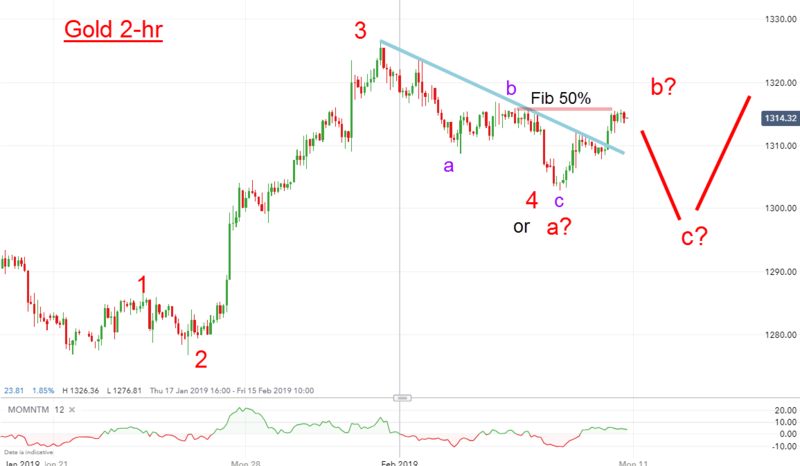 When using the Elliott Wave model to label a pattern, it is important that you choose labels that ‘look right’. In other words, the various waves should be roughly in scale to each other. A huge wave 2 and a tiny wave 4 would not ‘look right’ and should be discarded. In the above chart, wave 2 is 14 pips high and wave 4 is 20 pips high – and thus in scale. If wave 4 were 40 pips high, that would be out of scale with wave 2 – and a reason to look elsewhere. With my complete five down in place, I have high confidence my wave c of 2 top is in place and the next big move will be down. But first, with the large momentum divergence at the purple wave 1 low, the late Friday rally was not unexpected. This is purple wave 2 and it could possibly carry up to kiss the lower blue tramline, but doesn’t have to. At last week’s high, the market started a decline and formed an ‘overshoot’. 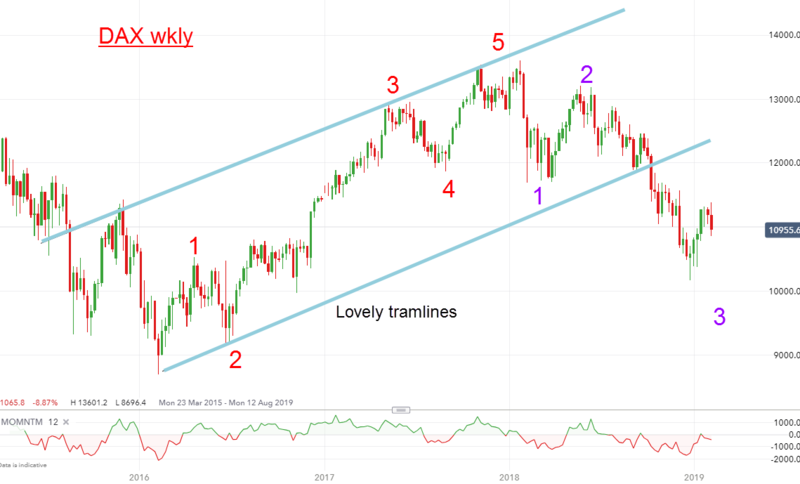 Coming at the end of a long trend, these usually signify a ‘buying climax’ which heralds a sharp decline, which is what occurred on Thursday and Friday. Note the very clear triangle in the wave 4 position on the way up. 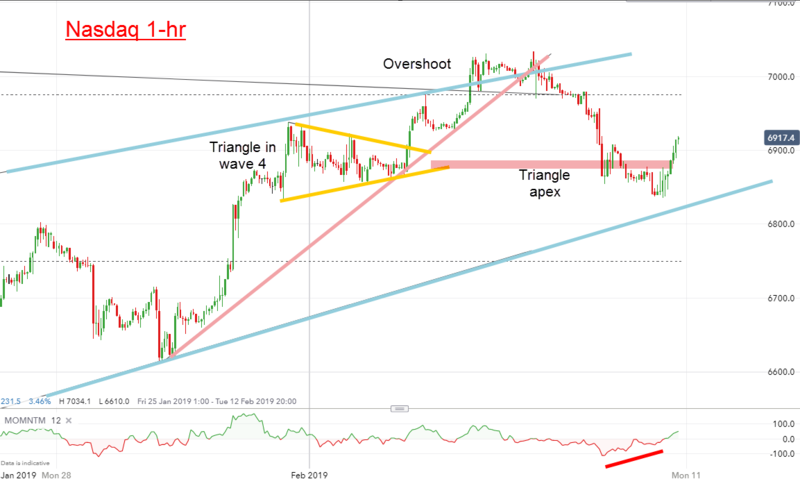 When the market turns down from the final wave 5 (at the overshoot), the first target is often at the area of the apex of the triangle – and that is precisely what occurred. 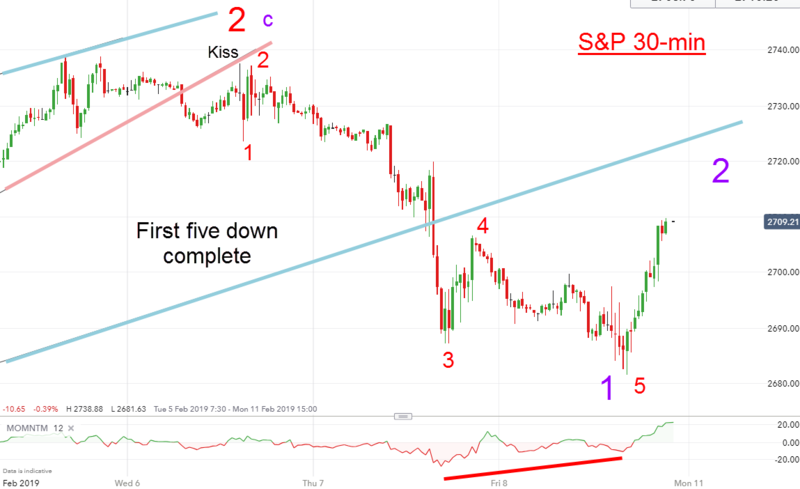 With the large momentum divergence there, a bounce was on the cards – and this is what occurred. So, all of the short-term moves I anticipated – in advance. That is the magic of chart reading. Some die-hard fundamentalists consider it no better that tea leaf reading or astrology. Actually, although I have never met a tea leaf reader (to my knowledge), I have met some tarot card practitioners and astrologers and I can tell you some are exceedingly good at highlighting likely outcomes. As a technician, that is all I can do – make percentage forecasts of likely outcomes using my Tramline Trading methods. As in all walks of life, some practitioners are better at it than others. Hand the keys to a Formula 1 racing car to a tyro and to a professional driver and you are likely to see two very different results! I am sure you can see that in order to detect a major change in a market’s trend requires eagle-eyed concentration. Eyes must be regularly focused on your screen – or let me do it for you! Is Britain leaving the EU at the right time? Leaving the ever-messy politics aside (which is always a pleasure), and assuming the referendum result to leave the EU will be accomplished next month, will the Not-So-United Kingdom be deserting a sinking ship that is the EU? Mercantilist Germany has been the economic driver of the EU for many years but suddenly, that engine is now sputtering. Their car industry has been the envy of the world but has hit major headwinds. First came the ‘dieselgate’ emissions scandal where pollution tests of new models were revealed to be faked. Then came the sudden ‘discovery’ that diesel engines were major polluters of particulates and NOX – and sales flopped. Germany has relied on these engines to drive sales. 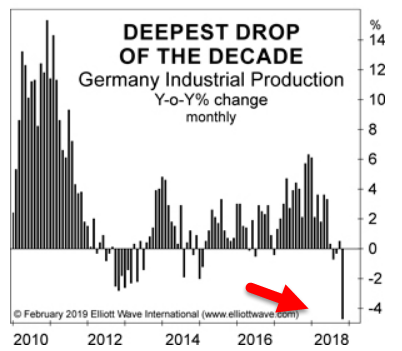 Then a major importer of German cars – China – is suffering a huge economic slow-down and sales there have crashed. Perhaps a little late in the day, VW has entered the EV sector, which is becoming ever-more crowded. But profits from entering the EV market will be slow in coming – another drag on share prices. This is the weekly chart from the 2016 low. Note the high (wave 5) was achieved way back in June of last year – a full four months before the tops in the Dow/S&P. I guess the market got wind of the approaching storm in Europe well in advance of that coming in the US of A. The EU is leading the global charge lower – if we exempt Japan, which topped in 1990. There is some talk of Britain then being able to slash corporate taxes and VAT on consumption, which in previous eras was unthinkable. That would put the UK in a strong competitive advantage – and likely result in more social disruption in Europe. But taxes always rise – that is a given. Until the next crisis, that is. The USA is much more amenable to slashing taxes – indeed, Trump has recently done just that. But not so readily in steady-as-she-goes bureaucratic risk-averse Britain. Some pretty wide swings! And definitely not a buy-and-hold trade!! My swing trading strategy is the preferred option (as it is in almost all the current market setups). The one exception is the third waves where ‘long and strong’ moves produce huge gains. The purple wave 3 stretched from the 70 low to the 95 high – a mammoth move with only a few setbacks. These are the waves I love to trade! 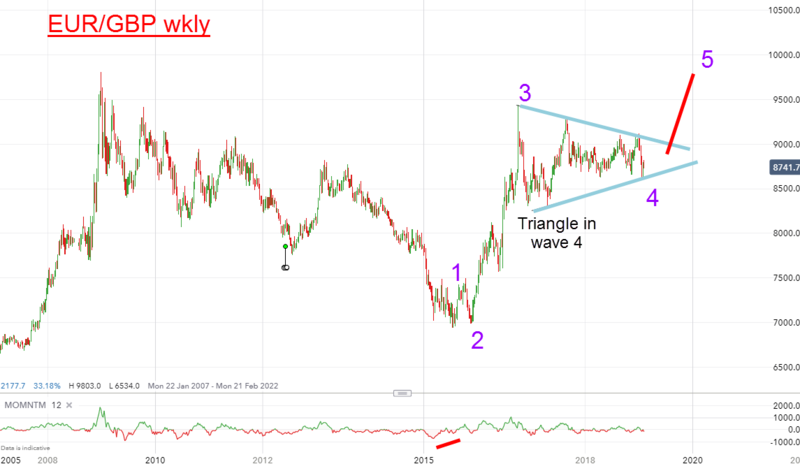 So with the market tracing out a lovely triangle in the wave 4 position, odds favour a move to new highs in wave 5 above 95. If so, the euro will gain on sterling after Brexit Have traders decided that the UK will slash taxes that will lead to a short-term deficit boost? Hmm. For the VIP Traders Club I have been taking profits on small swing trades and plan to continue doing so. It has made a three down already and has rallied above blue trendline to the Fibonacci 5-% level. Now it has two main options. First, it could maintain rally in fifth wave. or it could turn back down off the new b wave to make a new low in a new wave c of 4 before turning back up. My original downside target was the $1280 area but that appears less likely now especially with the new downtrend in shares. We shall soon see. Here is a new video on what you will receive when you take a Free Trial to either my VIP TRADERS CLUB or PRO SHARES. To take your Free Trial, go here.